The DigitalBits Project is focused on driving mass market adoption of blockchain technology. It’s time to bring cryptocurrencies to the masses. 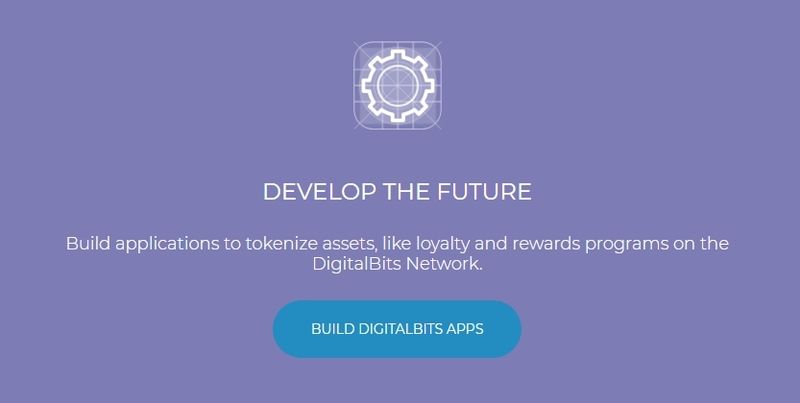 DigitalBits is a protocol layer blockchain designed to help facilitate liquidity of various digital assets and integrate with existing consumer applications to drive mass-market adoption. The built-in decentralized exchanged equipped with multi-hop technology creates a flexible marketplace for digital assets, and the network reaches consensus through a construct of Federated Byzantine Agreement. DigitalBits, a fork of Stellar, shares many of the benefits of Stellar but differs in key aspects such as not subjecting its native tokens to inflation, developing a token name certification service and an automatic algorithmic token distribution. DigitalBits looks to introduce transferability and portability to new and existing digital assets, facilitating the seamless and near instant transfer of value. Most forms of cryptocurrency and blockchain technology face challenges and are intimidating to those not involved in the industry. As a result, global adoption remains low, as this technology is in conflict with current learned consumer behavior, reducing its appeal when compared to easy-to-use and familiar legacy systems. 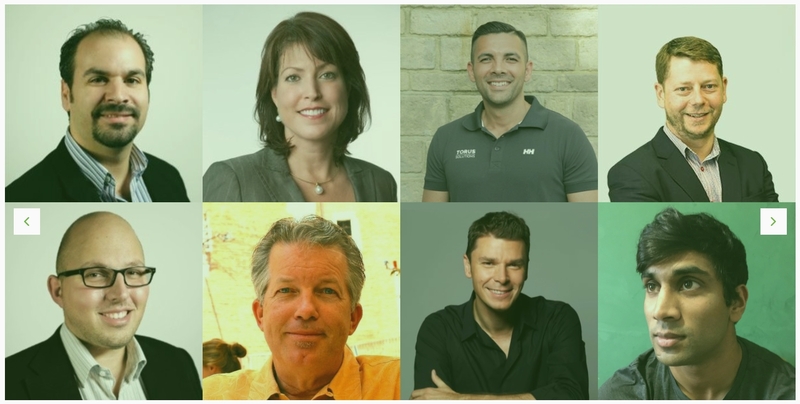 A substantial portion of society already possesses some form of the legacy digital asset. Common examples are loyalty and rewards points (e.g. Starbucks Rewards and Marriott Rewards). Tokenization of these assets on the DigitalBits blockchain increases utility without the need to alter learned behavior. The protocol allows seamless integration of existing consumer applications, enabling them to leverage blockchain technology to help facilitate mass market liquidity for those digital assets. Through this method, DigitalBits is able to interface society with the benefits of blockchain technology, improving user experience and amalgamating more assets into the cryptocurrency ecosystem. The bridge server enables applications to use the federation and compliance servers to send and receive payments. When a sender wishes to send a transaction. the sender's client contacts its bridge server to initiate the transaction. If required. the bridger server then connects the federation server of the receiver and its own compliance server. If all verifications are successfully completed. the transaction is recorded in the DigitalBits network. 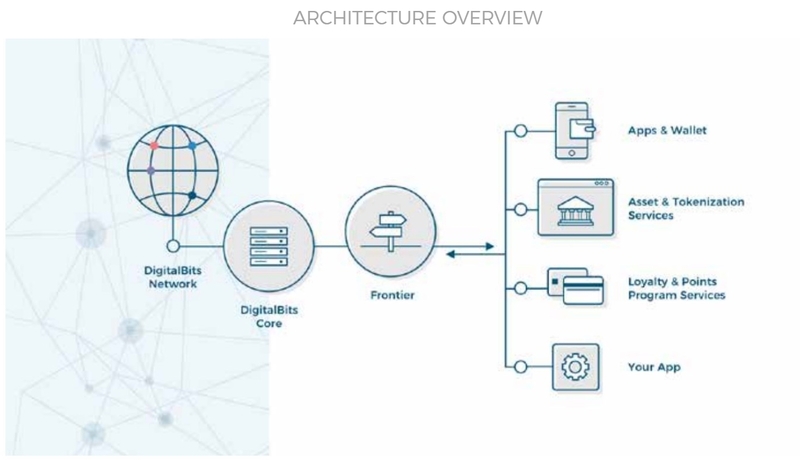 The bridge server on the receiver's side periodically monitors the DigitalBits network and spots transactions destined for its end-point, connects to the required federation and compliance server, and accepts the transaction. The bridger servers then inform the respective end-points about the result of the transaction. 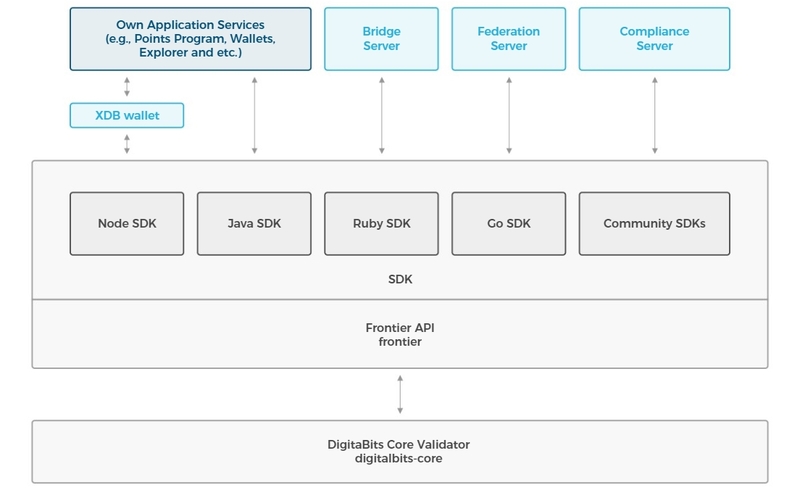 Businesses and third-party developers can easily develop custom Apps by leveraging the Frontier API and DigitalBits SDK. DigitalBits also provides wallet source code that can be directly used or easily adapted to create a brand-specific wallet. The bridge server facilitates easy access for the end points to the federation and compliance server. The DigitalBits protocol enables the seamless on-chain transfer and trade of assets. targeting non-tokenized assets that suffer from issues such as lack of liquidity. transferability and portability. The two elements to be discussed are matchmaking and cross-asset multi-hop payments. Users create an offer to buy/sell an asset. In order to make an offer, the account must hold the asset the user wishes to sell. The user must also have a trustline set up with the asset issuer. The offer is checked against the existing order book for that asset pair. If the offer crosses an existing offer, it is filled at the price of the existing offer. If not the offer is saved in the orderbook until it is taken by another offer, taken by a payment, cancelled by the account that created the offer, or invalidated because the account that made the offer no longer has the asset for sale. 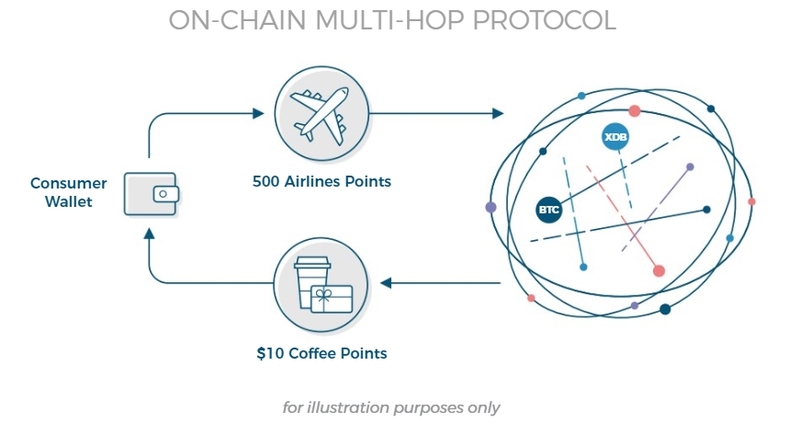 Multi-hop technology enables the ability for tokens to have higher liquidity, even if no direct market exists. For example. if assets are up to 6 hops apart. this technology makes it possible for the automatic trading across intermediate order books of other asset pairings in order to fill the user's intended trade. Since cross-asset payments and conversions are simple and seamless, users are not required to hold any unwanted assets just for payment purposes. Instead, they can hold their preferred assets, only converting if necessary. The DigitalBits system thereby creates an ecosystem where users never have to exchange tokens except at the point of sale. Users could, for example. choose to keep their favorite tokens. converting small amounts as needed. 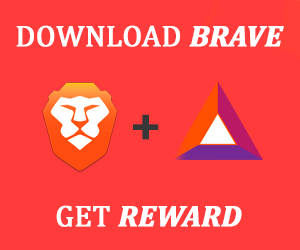 such as when an alternative token is required. Protective security feature - each account on the DigitalBits blockchain is required to stake a minimum of 10 XDB to ensure authenticity and to enable the send-function on the network. In addition, each transaction is subject to a minor transaction fee of 100 nibbs. or 0.00001 XDB. These features work to prevent users with malicious intentions from flooding the network. DigitalBits supports the vision of a true decentralized token economy. However, the current state of the market sees a lack of usage and general apprehension towards blockchain and cryptocurrency adoption. In understanding this, DigitalBits' approach is to integrate with existing consumer applications, thus porting millions of existing users onto the DigitalBits blockchain. Both consumers and enterprise adopters will experience the vast benefits of blockchain technology, with no required change in behaviour. Through this approach, DigitalBits will contribute to bringing blockchain and cryptocurrencies to the masses. DigitalBits is a next-generation project that’s tackling the challenges of usability and mainstream adoption. By bringing together technology, team and enterprise-grade execution, we’re bringing cryptocurrencies to the masses. To stay up to date on DigitalBits news and announcements, subscribe to Medium and Steemit channels, follow on Social Media and Twitter, and join the conversation on Telegram.